The resolution for 64bit AND 32bit and it works. will it detect it if it is a virus? I doubt it will be detected as a virus although it is certainly possible to have a virus use the same file name as any other legitimate file. Typically the FILE IS NO LONGER THERE type errors are an indication that the file has been moved (usually deleted) but the window you are looking at has not refreshed. Press F5, right click REFRESH or close and re-open to REFRESH your view. I followed the instructions on Win 7 64 bit machine. but I still get the module loaded but call to the DLL server failed with the hex message as above. What did I get wrong? File is in the SYSWOW64 directory, as stated and ran the regsvr32 command as instructed. I’m sorry to say I have no access to Win7 PC’s anymore. Perhaps someone else reading this thread can be of assistance. I got the same error with spywareguard. It said it was not found. i download MSCOMCTL.ocx and inserted it in the spywareguard folder. It did a very nice job. But, when I tried to install to SYSWOW, it said the file was already there. I takeit you need to install that file imnto the folder when you get that error message. Is Working Fine! THANK YOU, SIR! Thanks alot, it works under Windows 10 v1803. 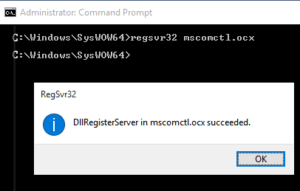 MSCOMCTL.OCX was in \windows\syswow64, but i think registration was damaged. New registration of the libary via regsvr32 solved the problem and saved me reinstall my laptop. Cheers fix TASBooks error which occurred on WIN10 64bit installing O365 and uninstalling Office 2010. Thanks a lot saved me smashing my laptop. Just to try it, I downloaded that Common Control Update from MSDN’s site via the link you provided, and I do not have MSCOMCTL.ocx installed on my system. Strangely enough, the package didn’t install the library (as it said it wouldn’t). Might want to adjust your article to reflect this. I have installed it more than once on desktops (never servers), without problems. It is possible that those PC’s had MSCOMCTL installed at some point in their history.